Our innovative team helps you specify, design, and implement solutions for your specific needs: efficient and elegant high quality software tailored to your company for an affordable price on time. We are a leading implementor of HbbTV applications in Germany. For IFA 2010, we teamed up with a number of broadcasters to deliver new and innovative interactive applications. Stay tuned for more information. Use our expertise to implement, create, design, and deliver HbbTV applications that are impressing, supported by a wide range of devices, and fast. No matter whether you need MHP applications (Xlets), or have questions about MHP set top boxes and their specifications: we are here to help you meet your goals. Our extensive knowledge about the Multimedia Home Platform allows us to support you bringing the new possibilities of digital TV to your customers. Among others, we developed several major MHP applications for ARD digital (the largest TV/Radio station in Germany and also the one most committed to MHP), and were contracted by the Institut für Rundfunktechnik (IRT) for the development of important parts of IRT's MHP Reference Implementation. 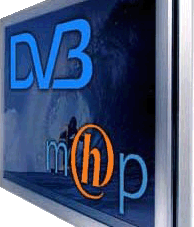 If you need specialized DVB related applications or services, MIT-xperts will bring you there. Our substantial knowledge in digital television standards combined with our innovative ideas and our experienced team guarantees productive, competitive, and astonishing solutions for your company.